Adam Claridge-Chang, and his team from the A*STAR Institute of Molecular and Cell Biology, have been studying the behavior of vinegar flies (Drosophila melanogaster). Optogenetics is an important experimental method that uses genes to express light-sensitive proteins to manipulate brain cells. "Optogenetics is a great tool," says Claridge-Chang, "but there is no clear path to go from optogenetics to therapeutics. It seems likely that future drugs will influence brain function through specific neurons that contain specific molecules. One promising class of molecules that could achieve this is venom peptides, which have evolved to target the nervous system." To do this, Claridge-Chang collaborated with Mande Holford's group at Hunter College in the US. Holford previously worked on cone snails, but had noticed that another group of venomous sea snails, the terebrids, had attracted much less attention. Terebrid snails, identifiable by their elongated cone shells, are an untapped resource of potentially medicinal molecules. The researchers selected two peptides, Tv1 and Tsu1.1, from Terebra variegata and Terebra subulata venoms respectively, to investigate their physiological effects. Tv1 was the first terebrid peptide to be structurally characterized, yet its function remained unclear. However, a previous study in cells had suggested that Tv1 might play a role in pain moderation. "We were interested to see whether Tv1 affected pain perception in a whole animal model", says Holford, adding that Tsu1.1—a distinctly different molecule to Tv1—was chosen as a control peptide. 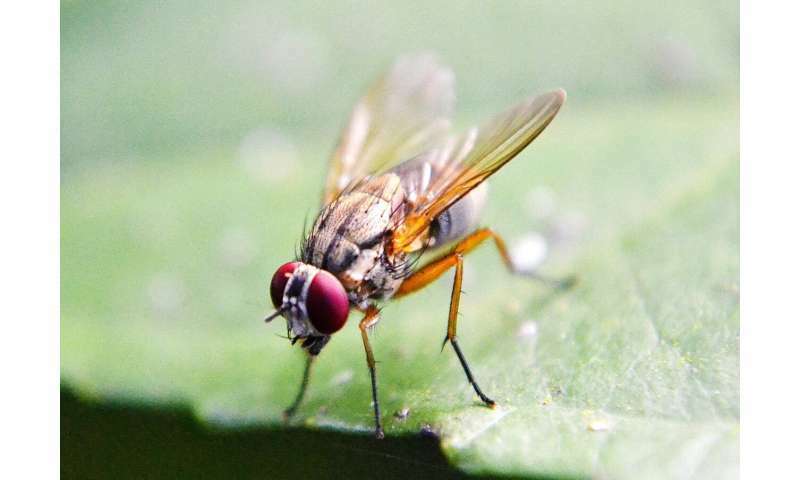 The researchers injected the peptides into vinegar flies and observed them in behavioral tests commonly used for modelling pain perception and obesity. "To our surprise, both Tv1 and Tsu1.1 showed bioactivity," says Holford, "and their activity was distinct". Injections of Tv1 made flies less likely to avoid dangerously high temperatures, suggesting their pain threshold was increased, and Tsu1.1 made flies eat more meals. Several thousand flies were used during this study, and the results suggest that flies could be used to study the physiological effects of venom peptides on a large scale. "Screening in this way would not be possible using mice, which are much more expensive" says Claridge-Chang. Venom-inspired drugs are already commercially available. "The biggest success story is exenatide, which is used to treat diabetes," says Claridge-Chang. "We expect that peptides, including venom peptides, will become a major biological drug category." The researchers hope that their technique will speed up the discovery of other potentially bioactive peptides that are hidden in the vaults of animal venom.